Location : Crystal Tokyo! Haha, I wish. My real location is... Internetland! Yay! Hi! I'm Celestial Tigress, though you may know me from the Galaxy Cauldron forums as Nyota, Fanfiction.net as Nyota Hyena, and/or DeviantArt as NyotaHyena. 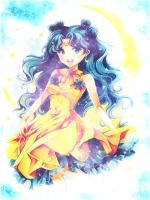 My favorite character is Sailor Vesta (love her to death! ), but I think I'm most like Ami in personality. I've seen all SM anime episodes and have read all the manga. I've also seen the Transylvania no Mori musical. I love roleplaying and animals (mostly big cats and hyenas). I have two dogs and a cat and my non-SM fandoms include Doctor Who, Disney, Harry Potter, and Kimba the White Lion. And that's about it. Hey! There and welcome! I'm Ed or Mama Chaos from GC. I havent been the most active person there or anywhere lately, rather busy with school but it's great to have you here! Welcome! I'm Yamichan16 on GC by the way. I havent really been active on there like I use to. Glad to have you here! I hope you like it here!